Creating and playing games with our kiddos is one of the joys in our lives, but after doing the same ones over and over again, we could all use a little inspiration. Red Paper Plane is here to provide it in the form of doable, multi-step missions that get kids thinking and creating. Dreamed up by a Mom and Dad with two young children, Red Paper Plane is designed to enrich play sessions with hands-on activities that promote a love of learning and foster a can-do attitude. Equally awesome: these age-appropriate and creative activities (designed for 3-6 year-olds) are FREE! The learning games or “missions” have three steps to be completed over the course of several days: observe and remember, select and prototype, and create and present. The three step process was inspired by Maria Montessori and invites creative problem solving for the whole family. Red Paper Plane keeps in mind the short attention spans of its target audience of three to six year-olds, with each step only taking about 20 minutes a day. Current missions include being a birthday planner, a family doctor, a meteorologist, a drummer, and a vexillologist (we had to look that one up for ourselves: it’s someone who studies flags). We adore the real-life scenarios that will help kids better understand the world around them and that will teach them useful skills. For example, for the Head Chef mission, the challenge is to prepare the Sunday family menu. In the first step, kids are asked to remember what they ate and drank during the day and then draw them in a diary. Kids keep the diary of meals for a few days before moving on to the second step, during which they choose their favorite dishes from the week and create a Sunday menu with the cooperation of the rest of the family. They also get to make the shopping list. Step 3 involves actually cooking the day’s food as well as setting and decorating the table. As another example, the Astronaut mission will help kids create a bigger picture of the universe and understand their place within it while they choose their route around the solar system and decide on what equipment and jobs they will need. The missions seldom require anything beyond some paper or a diary, printable paper stickers, and materials for basic craft ideas (such as a DIY chef’s hat or astronaut helmet with easy visual instructions). Red Paper Plane takes pretend play to the next level because the games get kids thinking about the process behind daily activities as well as the schedule and responsibilities for a variety of the popular professions that kids often aspire to. In addition to playing these learning games over and over, families will also likely see their periods of pretend play become richer and more involved now that kids will have a tool belt of observation and active skills to use. Cheers to Red Paper Plane for creating free and creative family learning activities that will inspire our kids (and us) to become interested and passionate about our world and beyond. The learning games or "missions" have three steps to be completed over the course of several days: observe and remember, select and prototype, and create and present. The three step process was inspired by Maria Montessori and invites creative problem solving for the whole family. Red Paper Plane keeps in mind the short attention spans of its target audience of three to six year-olds, with each step only taking about 20 minutes a day. Current missions include being a birthday planner, a family doctor, a meteorologist, a drummer, and a vexillologist (we had to look that one up for ourselves: it's someone who studies flags). 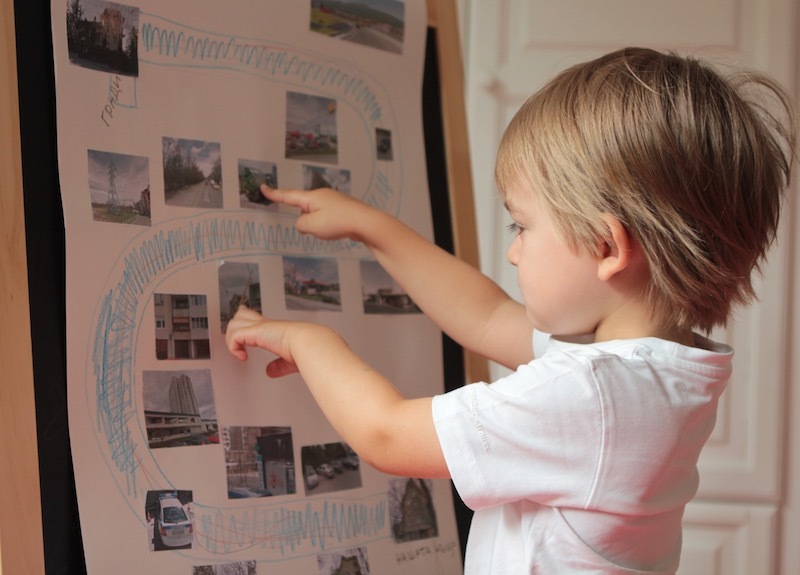 We adore the real-life scenarios that will help kids better understand the world around them and that will teach them useful skills. For example, for the Head Chef mission, the challenge is to prepare the Sunday family menu. In the first step, kids are asked to remember what they ate and drank during the day and then draw the items in a diary. 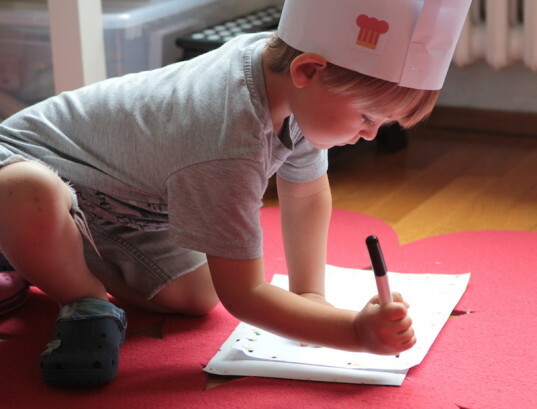 Kids keep the diary of meals for a few days before moving on to the second step, during which they choose their favorite dishes from the week and create a Sunday menu with the cooperation of the rest of the family. They also get to make the shopping list. Step 3 involves actually cooking the day's food as well as setting and decorating the table. As another example, the Astronaut mission will help kids create a bigger picture of the universe and understand their place within it while they choose their route around the solar system and decide on what equipment and jobs they will need. The missions seldom require anything beyond some paper or a diary, printable paper stickers, and materials for basic craft ideas (such as a DIY chef's hat or astronaut helmet with easy visual instructions). Red Paper Plane takes pretend play to the next level because the games get kids thinking about the process behind daily activities as well as the schedule and responsibilities for a variety of the popular professions that kids often aspire to. In addition to playing these learning games over and over, families will also likely see their sessions of pretend play become richer and more involved now that kids will have a tool belt of observation and active skills to use. Cheers to Red Paper Plane for creating free and creative family learning activities that will inspire our kids (and us) to become interested and passionate about our world and beyond.